To meet students’ demands in years past, UC Santa Cruz created numerous ethnic resource centers to offer professional, academic and personal support for students of color. The African American Resource and Cultural Center, the Asian American and Pacific Islander Resource Center, the Chicano Latino Resource Center and the American Indian Resource Center are only some of the spaces available for students who want to gain deeper cultural awareness. The resource centers also offer access to internships as well as leadership, networking and educational opportunities. Born and raised in Los Angeles, the new director of the American Indian Resource Center (AIRC) Rebecca Rosser refers to herself as an “urban Indian.” She is a part of the Mescalero Apache tribe, located in the southeast perimeter of New Mexico. Engaged with the American Indian community growing up, Rosser earned a Ph.D. in American Indian studies at the University of New Mexico in Albuquerque with the goal of helping native people in higher education. 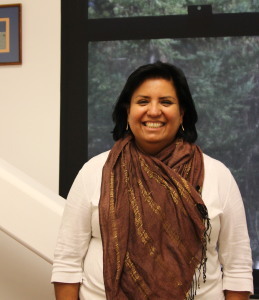 After spending seven years working for UCLA, she came to UCSC in September to continue educating students about American Indian culture. City on a Hill Press: How does the American Indian Resource Center provide for students on campus? Rebecca Rosser: We are here to not only help people have a place where they can meet people who are similar to them, but also a place where they can talk to someone who has been through the process of being educated and who is native. We really advocate for the need for cultural diversity and support. We support all students, it’s not exclusive. Students don’t have to be native to take advantage of the resources we provide. We really like it when students who are interested in the culture come around and participate in our events because it’s an opportunity for us to help people get educated about natives today. CHP: What do you perceive are the needs of American Indian students at UCSC? RR: One of the biggest obstacles to overcome is that people have an expectation of what a native person should look like or how they should behave, such as the assumption that everyone should have darker skin and darker hair. There’s a lot of judgment [toward] people who identify as natives and don’t look a particular way and it’s really important to educate people that we all look different. Many of us have grown up in the city and not on a reservation even though we are members of a tribe. Sensitivity about the contemporary lifestyle of American Indians is needed. There are 566 American Indian tribes in the U.S. and each one is different. I am Apache, which means I’m not Ute or Cherokee. There are so many differences between the groups. Native students could benefit from raising awareness across the campus, state and country. CHP: What is your biggest goal as director? RR: I want students to enjoy their time as students and know how much I want them to be successful. I also want to engage non-native students in the work of the center and help raise awareness of native people across campus. It’s about opening the doors really wide for those who are interested in working with us and learning more about what is going on with Indian people today.